When I was much younger, I read We Are Not Alone, by Walter Sullivan. In the forty or so years since then, the search for life outside our own planet has become far more sophisticated, and yet we’re still at the point where we haven’t found any. Are we searching correctly? Do we need to expand our ideas of how and what forms of life might develop on other worlds? Where should we look? One of the highest compliments I can pay to a science book like this is that I learned new things, and I have read many “is there life out there” tomes that didn’t do that. It’s important here to state that, no, the authors are not proposing that there’s intelligent life (such as on Earth) on some of the other planets or moons of our solar system. But, given the right conditions, there might be, albeit very simple, life forms. It is certainly possible that organic or prebiotic molecules are in existence, especially anywhere there might be liquid water — which recent unmanned space missions indicate could exist below the surfaces of several of Jupiter’s and Saturn’s moons. 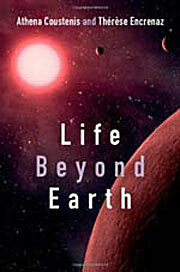 Life Beyond Earth carefully details how life can arise, where it can arise, and speculate on the likelihood of that happening. Dr. Athena Coustenis and Dr. Thérèse Encrenaz explore the possibilities of prebiotic, or life itself, existing under the (to us) unusual conditions on most of the planets and moons as well as outside the solar system. This is a thorough and interesting survey of what we know and how we can learn more. Caution: This is written at, I want to say, a college level. If you are expecting the sort of easy, non-challenging read of a Carl Sagan type book, you’ll be disappointed. A certain amount of chemistry and physics knowledge — not graduate level mind you, just that you remember your senior High School courses well — is recommended. Lastly, Life Beyond Earth is profusely illustrated, along with many color plates; I strongly urge you to purchase the physical hardcover rather than the Kindle edition for full enjoyment of it.